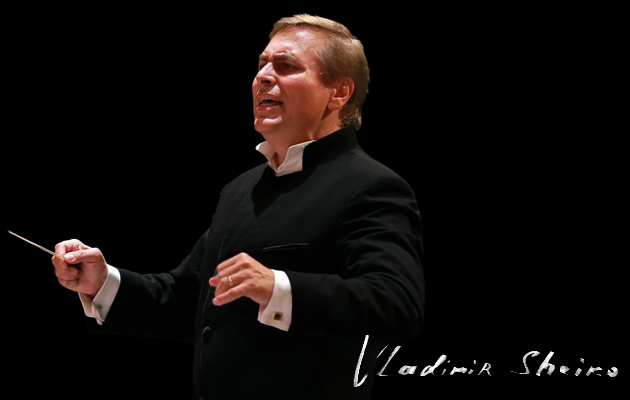 Vladimir Sheiko – Chief Conductor and Artistic Director of Ukrainian Radio Symphony Orchestra. He was born in Kharkiv (Ukraine). Vladimir Sheiko graduated from the Kiev State Conservatory named after P.Tchaikovsky, speciality «opera and symphony conducting» (class of Professor Stephan Turchak – Chief Conductor of National Opera Theatre of Ukraine) and «chorus conducting» (class of Professor Leo Venediktov – Chief Choir-master of National Opera Theatre of Ukraine) in 1988. During the 1989-1991 he was a trainee at the “Bolshoy Theatre of Opera and Ballet” (Moscow) under the supervision of Fuat Mansurov (conductor of Bolshoy Theatre) and took the highest qualification test. Vladimir Sheiko had been working as a conductor of the Kyiv Academic Operetta Theatre since 1988. In late 1990 Vladimir Sheiko created the first in the country non-state Symphony Orchestra “Ukraine” and produced extensive concert and tour activity during 1991-2001 (Russia (1991, 1992); Croatia (1993); Austria (1994); Italy (1993, 1994, 1995, 1996, 1997, 1999, 2000); Portugal (1997); Poland (1997); France (1995,1999); Switzerland (2000, 2001). During this time he has also made numerous Ukrainian Radio and TV recordings, CD production (Russia, Italy, England, Switzerland) as well as organized international annual Artistic Festivals «Meetings on Easter» (Kyiv, Ukraine, 2000, 2001, 2002) and co-organized Festival «Tenoratorio» (Solothurn, Switzerland, 1999, 2000, 2001) and participated in opening of VERDIANO – 2001 (Busseto, Italy, 2001). During 1994-2002 – large theatre activity, which includes many projects in various theatrical and oratorical genres, among them: "Yevgeniy Onegin" by P.Tchaikovsky; "La Traviata" and "Rigoletto" by G. Verdi; “Porgy and Bess” by G. Gershwin; "Carmen" by G. Bizet; "The Tsar's Bride" by N. Rymsky-Korsakov; "Il Barbiere di Siviglia" by G. Rossini; "Cosi fan tutti", "Impressario" and "Le nozze di Figaro" by W. A. Mozart; "Bamby" (ballet) by I. Kovacs; "Requiem" by G. Verdi, "Requiem" by M. Reger; "Requiem" by G. Fauret; "Magnificat" by J.S. Bach and many others. From 1995 till 2005 he worked as the Chief Conductor of the Kiev Academic Operetta Theatre and carried out 15 performances: “The Gipsy Baron” and “A Night in Venice” by J. Strauss; “Maritza” by E. Kalman; “The Count from Luxembourg” by F. Lehar; "Orfeo all Inferno" and “ La vie Parisienne” by J. Offenbach and many others. Vladimir Sheiko became the head of Ukrainian Radio Symphony Orchestra in August 2005. Under his direction the Orchestra performed such masterpieces as: "Requiem" by G. Verdi; Symphony No. 9 by L. van Beethoven; Symphony No. 6, Pathétique by P. Tchaikovsky; Symphony No.2 by S.. Rachmaninoff; “Carmina Burana” by Carl Orff ; “Stabat Mater” by G. Rossini; “The Execution of Stepan Razin” by D. Shostakovich; “St. Jonn of Damascus” by S.Taneev; “When the Fern Blooms” by Y. Stankovych; "Requiem" and “Davidde Penitente” by W. A. Mozart. ; "Le Poème de l'extase" by A. Scriabin, founded a series of joint projects of National Radio Company and National Television Company of Ukraine “Art Stories” and "RadioSymphony_UA". Also Vladimir Sheiko created a number of original monumental projects, such as his own stage version of “Carmina Burana” by Carl Orff at the National Opera of Ukraine and world premiere of “Symphonic Gospel” by Alemdar Karamanov at the stage of National Palace “Ukraine”. Under Vladimir Sheiko’s supervision as a conductor, the Orchestra carried out more than 300 records of world and Ukrainian music masterpieces in favor of the National Radio Fund. He has also conducted numerous tours with the Orchestra to 17 countries across the world: China, South Korea, United Arab Emirates, Iran, Algeria, Tunisia, Spain, Italy, Austria, France, Portugal, Netherlands, Luxemburg, Belgium, Romania, Poland and Belarus. Vladimir Sheiko was granted the title “Honored Personality of the Arts of Ukraine” in 2003. He was also awarded by the Honorary Diploma of the Parliament of Ukraine and the Order of St. Prince Vladimir the Great of the third degree in 2005. 2013 - awarded with the Order of Friendship. 2015 - awarded the honorary title of Ukraine "People's Artist of Ukraine".